3D Cityscape - Make 3 three dimensional skyscrapers with thick and chunky pieces. Fun to build and play. Mix and match to make your own buildings. 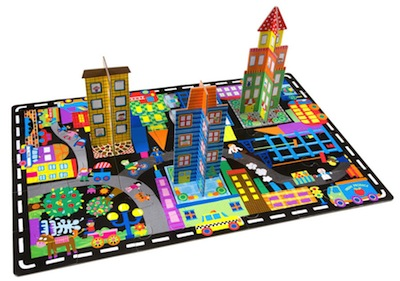 Put together the city pieces and roll your own cars around for added play. Includes 41 pieces. Made of recycled paperboard, soy inks, and water based varnish. Ages 3 and up.